Regular readers of these blogposts may recall that Books on First proprietor Carolyn Chin yours truly hails from West Babylon, NY. I don't believe I've been there in 15 years or more. All throughout my time there, we were able to say (proudly, derisively, matter-of-factly) that Geraldo Rivera, known in WB as Jerry Rivers before becoming ethnic to gain media tractability (I think it's called doing what would get him a higher "TVQ") was from West Babylon. An English teacher of mine used to say, "Oh, yeah, I went to school with Jerry Rivers. His parents still live here." WB had had some more notoriety: Jessica Hahn, the secretary to televangelist Jim Bakker, retreated to her parents' stoop in West Babylon to address reporters who had followed her there after the hush-money-for-sexual-encounter with Bakker and another minister came unhushed as uses for funds coming into the PTL (Praise the Lord) Church were being investigated. And, just like people here in Dixon and environs are proud to say that Sean Considine who has now been on various National Football League teams in the few years he has played professionally is from Byron, IL, a scant 25-30 miles away, I am sure people in West Babylon and environs, too, had reveled in the fact that Jovan Belcher, an NFL player, most recently with the Kansas City Chiefs was from WB and his mother still lives there. On 1 December 2012, after a night of arguments, going to separately going to a favorite nightclub with different companions, Belcher killed his girlfriend and then, himself, orphaning their 2-month old daughter Zoey. Chances are, Zoey will be going home with Belcher's mother to West Babylon. P.S. 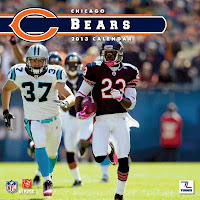 By sheer good luck, the 2013 Chicago Bears calendar has a bonus: the cover photo is of Philadelphia Eagle Sean Considine chasing a Bear. So, whether you're a Sean Considine fan, a Bears fan or not a Bears fan, Books on First has the calendar for you.